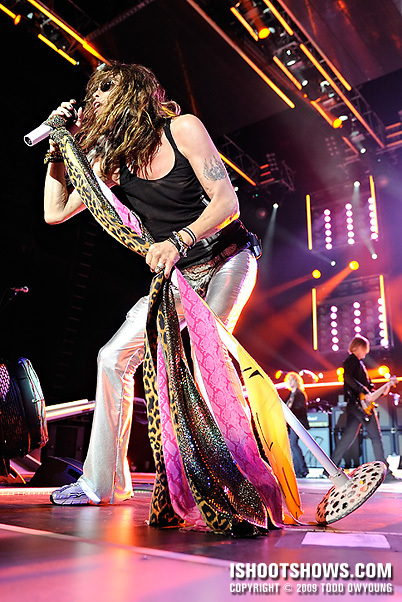 June 10, 2009 – When Steven Tyler is on the catwalk, bends down, and starts singing directly to you, one fact is made simple and abundantly clear: this is a pretty good gig. Personal serenade aside, this show was amazing. The hazards of a fierce lightning storm and torrential rain couldn't stop the rock, only delay it. Taking the stage 45 minutes after their scheduled start, the “Bad Boys from Boston” took the Verizon Wireless Amphitheater by force with rock star charisma and a set of world-class lights. This was a fantastic show to photograph. Despite the long delay and getting soaked to the bone walking back to my car after shooting, there wasn't too much that could keep me from grinning as I left this concert. The rules for this show were first three, no flash. There was also a relatively long catwalk into the audience, so photographers were corralled into one spot where the walk met the stage. Due to a curtain drop, we weren't allowed in the photo pit, though tour management said that this may change during the course of the tour as the logistics are worked out (this was the first show of the tour). 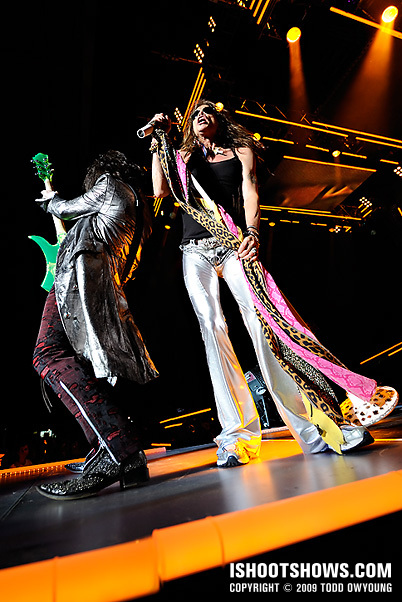 This positioning gave fairly good sight lines to Steven Tyler and Joe Perry at the expense of the other band members. A large fan at the corner where the stage met the catwalk prevented clear shots of the middle of the stage, but Tyler and Perry generally made good use of the space to maximize photo time. The third song in particular was excellent for photography, as both Tyler and Perry came to the first few feet catwalk near the press area and gave us plenty of face time. 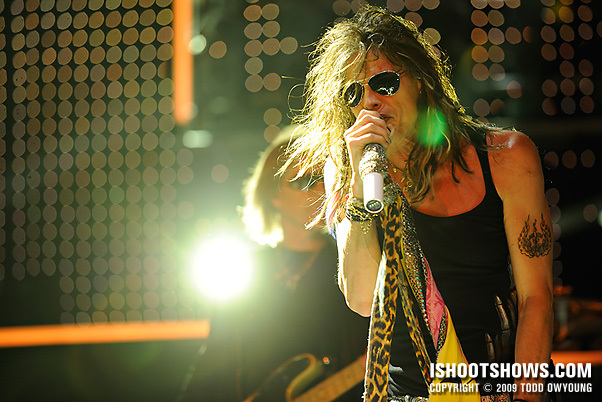 The third song is also when Steven Tyler took the liberty of singing into my lens not once, but twice. I'm just going to chalk that up to the Nikon 14-24mm's magnetism – rock stars just can't resist its bulging front element. 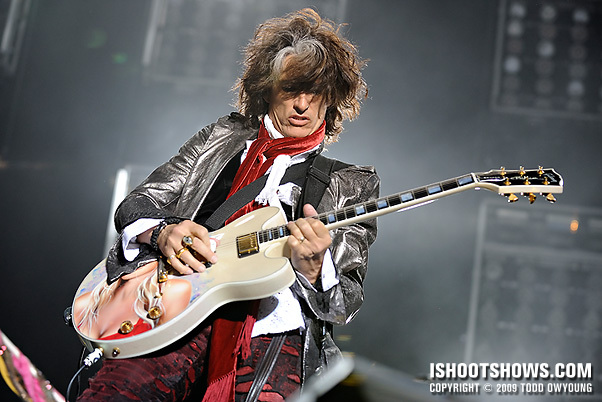 I photographed this concert with the Nikon 70-200mm f/2.8 and Nikon 24-70mm f/2.8. The 14-24mm f/2.8 also saw some time, but given the height of the stage and catwalk, I think I could have done without the ultra-wide. 24mm on full-frame is plenty nice for when Tyler and Perry come to the catwalk, but 14mm monkey jumped on my back and I just had to go for the ultra. If you're shooting this tour, you're in for a great assignment. Hey Chris, thanks for the comment. I was shooting for a lifestyle/entertainment site affiliated with a broadcast company here. Other shooters here were shooting for daily papers and a variety of other news outlets. There were a lot of photogs who showed up, but it was also the first date of the tour. There might have even been some wire shooters in the mix, I thought I heard some talking about that. Now those are some amazing photos! I’d love to shoot that show. Thanks for the comment. 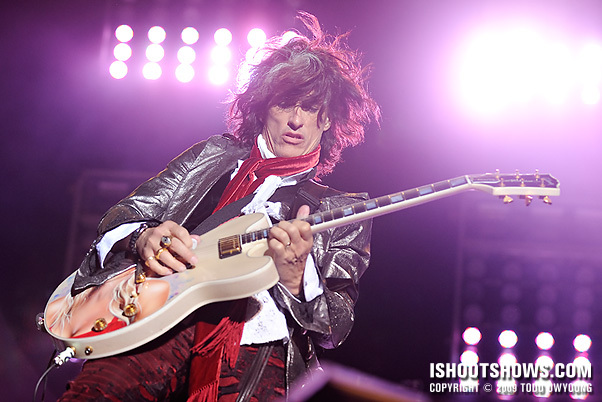 Aerosmith put on a great show — even after (or especially because of) a 45-minute rain/lightning delay. I know a lot of fans left because of the severe storms – and it was a “rain or shine” event. hey todd, thanks for the info. i’m applying for retna so hopefully i’ll be able to get in. i am also looking forward to shooting zz top if i get in. those are two bands i’ve wanted to shoot for a long time! Good luck. I don’t know what chances there are of getting it through an agency, though. ya, i remember seeing those shots. they are great. the twelth one down is my favorite. i love the color. Just approved, cannot wait to shoot this tour! Freaking awesome set, perhaps the best yet. You’re going to have a blast, Allen. Hope you get some killer shots. I can’t even imagine what the entire lighting set up looked like in order the achieve what I’m seeing in your shots. That’s got to be atleast 2-3 semi’s worth on it’s own. 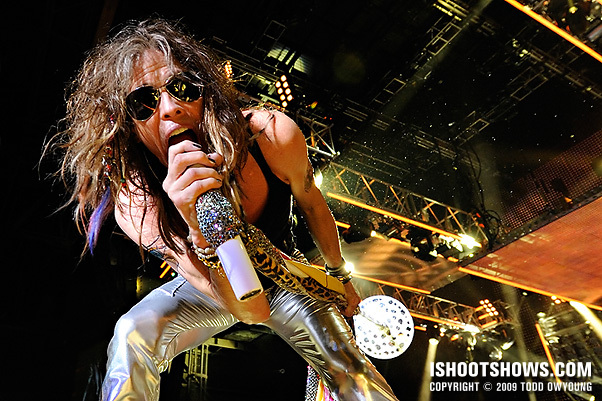 Awesome capture of Steven singing right into your lens! That dude has a long happening on and around him. The full frame focus is awesome. I bet Steve Perry’s acrylic body guitar was fun to shoot too. Will any of these shots see publication? It was a pretty massive stup. There were also panels and tons of lights mounted in the ceiling — these were lowered for the third song, I think. Perry’s acrylic/Lucite guitar was pretty nice. The Lucite really helped pick up the lighting for a cook glowing effect. All I know is that my Live Nation folks passed on the images to the tour, which is nice. Great set, Todd! I’ve been waiting for you to post these, and they were more than worth the wait. Can’t wait to see them with ZZ Top in August – it’s an outdoor show here. Thanks for the comment, nice to hear from you. I’m glad to hear these images from the concert were worth the slight wait on them. This was an outdoor show at an ampitheater, too. Thanks! You know, I’m not sure if he did this with other photogs or not – I don’t specifically recall – I just know he did it to me, twice. Hey Ian, thanks very much. Hey Bryan, thanks for the comment. It’s an awesome show, and I’m greedy – I want more. Hey Valerio, thanks for the comment. Awesome set! Great job on nailing the framing and focus when Tyler suddenly moves towards you (both times)! You can just feel the power from these aging rockers. There seems to be some additions to your portfolio here. I don’t even miss the drummer. Hey Thomas, thanks! Great to hear from you here. Both times Tyler leaned down, it was a pretty surreal experience. 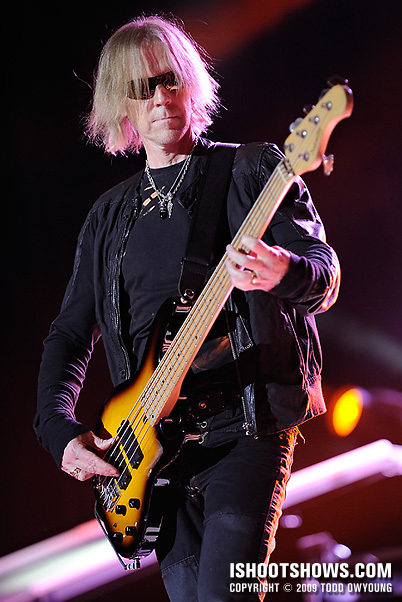 Todd, each image is simply stunning, really great work capturing this iconic band! Thanks for the kind words, nice to hear from you. Did you just say “bulging front element”? Great shots, particularly the first and last shots. 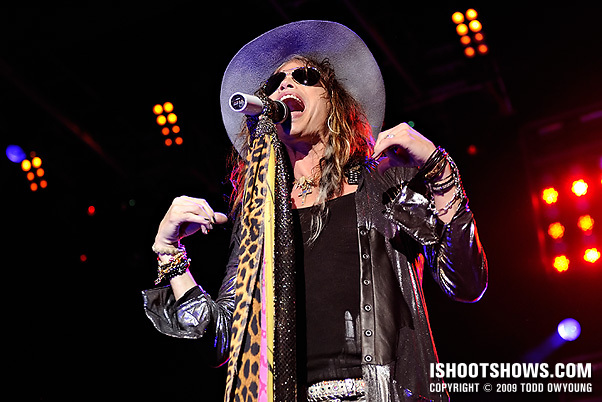 Steven Tyler is saying you are the #1 concert photography! Ha, thanks. Yes — bulging front element. It’s the business end! Freakin’ fantastic, Todd. That first shot is going in your portfolio for sure, right? Hey, Tasha. Thanks! Yeah, I’m going to squeeze in the lead shot either first or last in my portfolio. There are also some shots from Poison, the Yeah Yeah Yeahs, and maybe a few more that I want to fit into the rotation. No wonder you got such cracking shots! Love the first one! Good lord…those are amazing! I would love just to watch you work. This was the perfect combinataion of photographer and musical act! These left me speechless! Just Epic. These are some of your best images Todd. Fantastic. 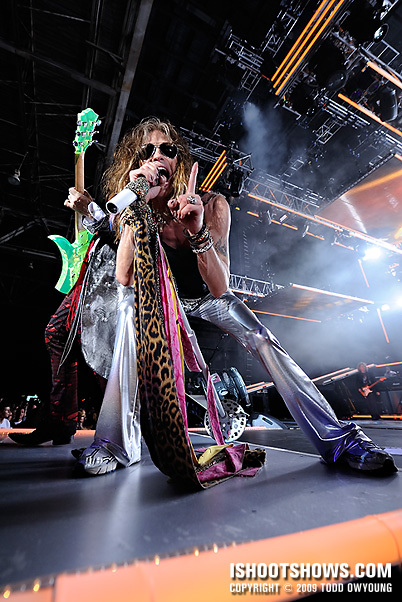 And yes, Steve Tyler is very communicative with photographers. …that is so funny, I was just thinking the same thing yesterday…I would love watch Todd work! 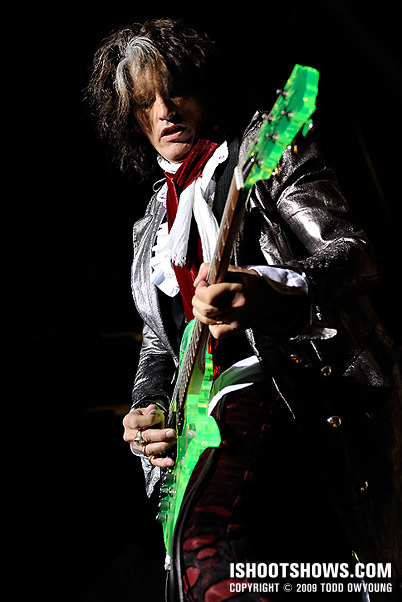 I was just confirmed for Sunday’s show – now its down to the first 2 songs !!! When I got the confirmation email, it said two songs as well, but we were then told three in the pit. Let me know if you really are limited to two. Maybe they were just feeling generous since this was the first show on the tour, who knows. I cant believe the actual technical aspects of these photos. Whoever is reading these pages, know that pictures this good are very difficult to take. EXCEPT if you are Todd Owyoung. Great Shots! Hey Taylor, thanks very much for the kind words. The “green earring” shot – are you talking about the shot with the green ghost/flare? That was one of those serendipitous shots. The lighting on the guys was really bad – almost all backlit – but I lucked out with some fill for this one. I wish there wasn’t the flare there, but it’s inevitable with the spotlight shooting right into lens as it was! The picture where it looks like he has a green earing? This has to go into your portfolio. Great work. Do you work primarily for Metromix? If you shoot for them do they keep your photos? Can you re-distribute them? I shoot for Retna and Im in the Midwest, originally from LA, finding its tough in the Midwest, super easy to get into shows in LA but not so much here. So, when Tyler bends down towards you like that, does he stay long enough to let you think what’s going on? Obviously, you managed to focus, compose and get the right exposure, as well as time it perfectly. The pressure was on, and you delivered! Did you think consciously about what was happening, or is it all spinal reflexes by now? Honestly, I don’t really recall how long Tyler was leaning over – it couldn’t have been much more than a phrase or two. Maybe a few seconds? A lot of the execution did come down to reflex – there really wasn’t any time to think about it. My exposure was already dialed in, but all the moment allowed for was focusing, composing, and praying to the rock gods to please, please: let me have this one. Still wondering about Metromix. Whats it like working for them? Do you keep the rights to the photos? Or is it a buyout? Are they getting the access for you? Metromix is fine, but I think that the publication varies in different markets. I generally prefer to setup all my own credentials, regardless of who I’m shooting for. 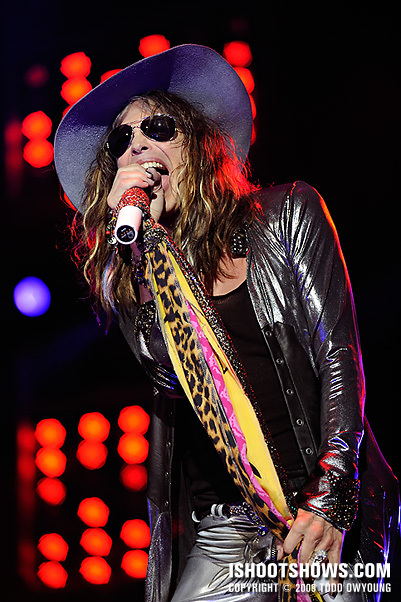 Definitely a defining moment when you’re serenaded by Steve Tyler! It was pretty surreal, and at the same time, pretty much a blur now. It’s a good thing I have the snapshot as a memento. Nice to hear from you here. Hi again Todd, i wonder if there’s any chance to view the EXIF’s of your pictures. That will really helpfull. I don’t have your gear, but to have an idea of what is fine and what isn’t. Do you have a question about a specific image? The settings I use change from concert to concert, song to song, and sometimes frame to frame. It just depends on the lighting. For shows like this with lots of light, it does make exposure easier. 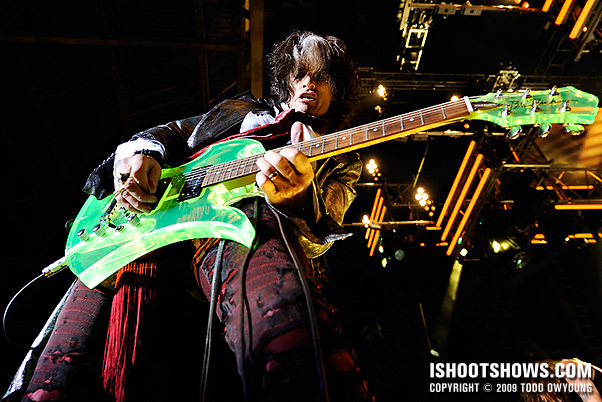 I was shooting mostly between ISO 800 and ISO 1600 for Aerosmith’s show. Thanks for the answer Todd. I think i’id write a post in other thread, but i guess it was lost in the air before publish. Im from Argentina (that maybe explain my english) and im in the photography world since around 2 years. I have a lot to learn yet (actually im graphic designer). And im close to my first “professional” assigment (i hope). I made a contact with a radio speciallized in rock music. They can obtain photo passes to any show that i want (not the big ones like Madonna and so on) but they say that can’t pay me for the momment. The idea (my idea actually) it’s to create a kind of music or rock photography blog in addition to the actual website (not my website, instead the radio’s website). They said that it’s a good idea, but for the momment can’t pay me for the work (but i still having photo passes anyway). So, the thing is, i really want to work with them. I need to get as much pictures as i can to incentivate the editor to create that blog, but, if i still giving the images for free, they never going to hire me, right? and if i don’t, they never make the blog…so, is there wrong what im doing? How can i know where to stop giving for free?. I’ll really glad if you can visit my recently maded website (just a weeks ago, so haven’t much material yet) and give me a feedback, really. I’ll just give this quick bit of advice: The only reason to work for free is when you can convince someone else that you got paid for it. Rules were the same here in CT last night — first 3 (though it stated 2 on the confirmation), everyone jammed in on Perry’s side, and held out of the pit until after the curtain drop. Challenging, crowded conditions in the pit, but tons of fun. It’s interesting to hear that they moved the photographers far over from the catwalk. 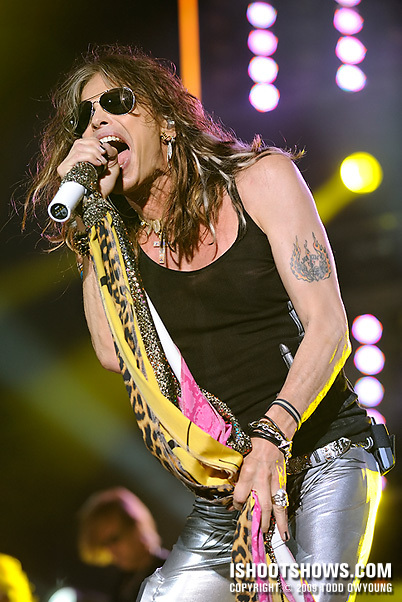 Still, it looks like Steven Tyler still comes over to pose, so that’s a good thing. It’s a pretty small arena at Mohegan Sun, really too small for a catwalk of that size, and I’m sure they were cramming as many $150+ seats in there as possible. The videographer was positioned in the corner where the stage and catwalk met, with room for one limber photog to jam his way around if he was feeling brave. Fortunately, Tyler and Perry seemed to recognize this and made sure to spend a bit of time on the main stage in front of us sardines in the pit. I’ve heard that for some shows they let half of the photogs shoot from the other half of the stage (which is where we shot ZZ Top from), but at Mohegan they were clearly flying from the seat of their pants figuring out what to do with everyone. Definitely some frustrated photogs in the pit that night, but I personally had a blast. They definitely didn’t do Joey Kramer any favors with the stage setup for this tour — good luck to anyone hoping to get a nice shot of the drummer! Thanks for adding a bit more on the setup, I hope some people shooting the tour read this. I’m still a little jealous we missed out on ZZ Top – that would have been a killer double bill. Beautiful shots!! How do you get a gig like this? I was fortunate enough to see the actual contract Aeromith signed in 2006 and go my Canon S2 IS in. I watched the entire show through the lens and was elated. That was the Motley Crue add in and so it was a double bonus. These shots are absolutly perfect. Having been to many many Aero shows, you truely captured the essence of the atmosphere here. Have spoken with 3 pro photographers lately and everyone seems to be using Nikons. Guess it’s time to switch up! 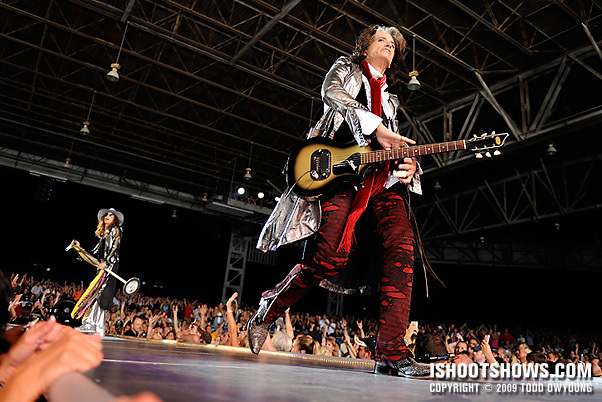 Todd, these are the best Aerosmith shots I’ve ever seen, full stop! I need to get myself one of those 14-24 bad boys. Possibly a stupid question, but what ISO did you shoot at, and do you meter manually as you go or shoot RAW and stick to aperture priority? There’s such clarity in these shots. I’m on a D3 and 70-200 Nikkor too, post processing in Lightroom and CS3, generally shooting at ISO1600 but I seem not to get anywhere near this level of punch and clarity…! !